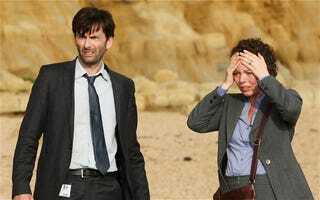 Is anyone here watching Broadchurch? I just watched episode six right now. I don't think I can wait another week. Seriously, HOW AM I SUPPOSED TO WAIT ANOTHER WEEK? There's so many mysteries I want answered. I just want to know what's going on. Please? Can someone just tell me what's going on? And, hopefully, not kill off the 10th Doctor again? And make a spin-off show about 10th Doctor and Prisoner Zero-guise traveling all over Britain, solving similar crimes? She could bring her twins. I'm down for anything now. I'm also open for the possibility that Prisoner Zero has escaped again, taken its old guise back and is now solving crimes with the 10th Doctor, who's forgotten who he is and that what we really saw in Tennant's last DW-ep and The Eleventh Hour was The Doctor splitting in two. Going from this theory, Matt Smith is showing up in episode 8 and it'll all tie into the 50th Anniversary.